MSE Audio distributor Sound Directions U.K. recently completed an audiovisual installation in the newly reopened Mary Rose Museum, with SolidDrive units comprising an important part of the AV experience. The Mary Rose, a Tudor warship built for the English navy of King Henry VIII in 1510, sank in 1545. Rediscovered in 1971, the wreck of the Mary Rose was raised in 1982 and towed into her home port in Portsmouth, England into a covered dry dock to begin conservation. More than 34 years of conservation work ensued, where for more than 30 years the ship was sprayed with fresh water and wax to preserve the timbers. A permanent museum building was constructed over the ship and in 2013 the sprays were finally turned off. The ship was controlled air dried over the next three years and on July 20, 2016, she was revealed to the public to allow it a completely clear and uninterrupted view. Originally opening doors to visitors in May 2013, the museum was closed for most of the year while the latest development works were undertaken, to allow full height viewing of the ship from three separate viewing angles. The updated Mary Rose Museum now provides panoramic views of the ship from all nine galleries through floor-to-ceiling glass on the lower and main decks. On the upper deck, visitors enter the Weston Ship Hall via an airlock and are separated from the ship only by a glass balcony. The latest phase of work included an audiovisual installation to enhance interpretation and visitor experiences; a creative team led by exhibition designers Real Studios was brought in to tell the story of the ship’s crew going about its daily routines both at war and peace. More than 60 short scenes were filmed and produced by Graham English and Company and projection mapped by Sysco AV into the relevant cabins on the ship’s hull. Together with lighting design from Adam Grater of DHA Designs and an accompanying atmospheric soundscape produced by Peter Key Sound Design and Production, the ship is brought to life for the visitor at intervals throughout the day. “The SolidDrive SD1 surface exciters provide a very discreet solution for visitor attractions including museums, as they provide excellent quality audio while being almost invisible, particularly when glass surfaces are used for encasing the exhibit,” said Stanislas Boivin-Champeaux, managing director for Sound Directions. In total, four SolidDrive SD1g units were installed along each deck level over a distance of 40 meters, with each SD1g driven by a separate audio channel of a SolidDrive SD-250 Mini amplifier. Audio reflections from the opposite side of the corridor, behind the visitors’ viewing area, fills in the sound and enables the use of fewer units and amplifier channels than might otherwise be required. 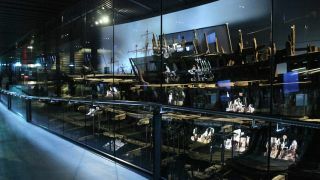 “We are delighted that the combination of sound and projection not only brings the ship to life, but also re-establishes the relationship between the ship and the thousands of real objects in the context gallery walkways,” said Robert Lapraik, deputy chief executive for the Mary Rose Museum.